This great Lake Hartwell home is just 10 minutes from I-85, Exit 173. Enter the home into the vaulted great room with wood flooring, stone fireplace and a wall of windows overlooking the lake. The great room is adjacent to the dining area and granite kitchen and opens onto a large deck. There are also two bedrooms and a full bath on this level. Upstairs, you will find a private bedroom and bath and sleeping loft for overflow family or guests. The lower level has a lakefront rec room with wet bar area and a media room which could be used for additional sleeping if needed. There is also a handy storage room with direct access to the lake. Outside you will find a fun patio area with firepit for enjoying the cool evenings. There is a gentle path to one of the lake's main channels, and the dock is included in the sale. 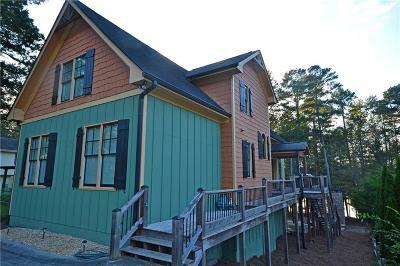 This home has a fantastic vacation rental history that could be continued to recoup part of your investment.